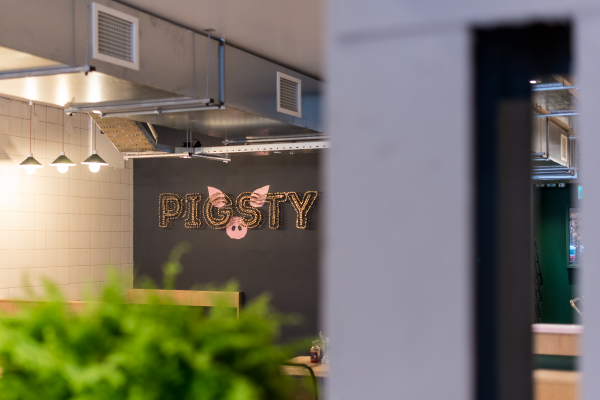 Pigsty, a new neighbourhood restaurant and bar on Bristol’s Gloucester Road, has opened for business, with all interior design and graphics on the scheme created by Bristol-based hospitality and retail specialists Phoenix Wharf. 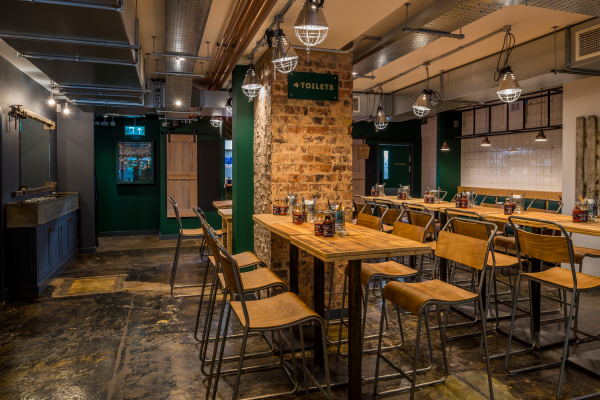 The 100-cover space, aimed at families, couples and group diners, offers high-quality dishes based around good quality, local produce and the company’s own pork products from The Jolly Hog – all prepared with taste, flair and heart and served in a fun, stylish and contemporary environment. 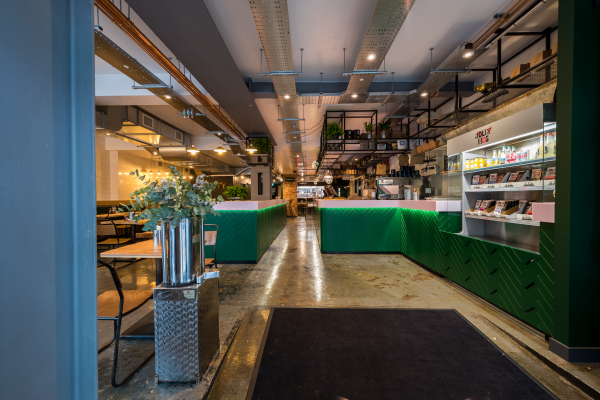 Founded in Bristol in 2015 and independently-owned, Phoenix Wharf specialises in strategy, graphics, spatial and digital design for ambitious retail and hospitality brands. 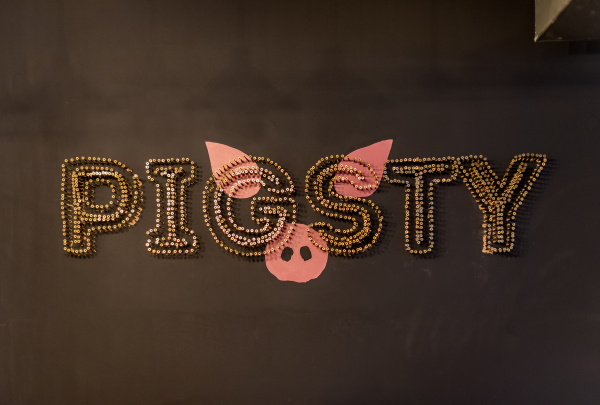 The design brief for the first permanent Pigsty site was to evolve the look and feel first expressed in their shipping container outlet, but to raise the bar by creating a more grown-up, premium feel and catering for customers who want to sit and linger. 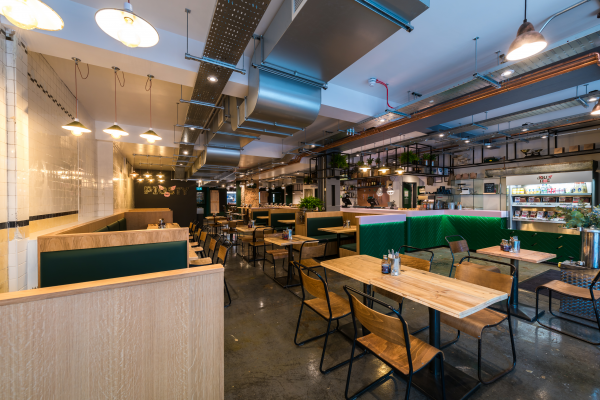 The design also reflected the location, as Gloucester Road is an up-and-coming area of Bristol, which has a young and edgy feel at one end and a more traditional, pubs and retail-focused focus at the other end. 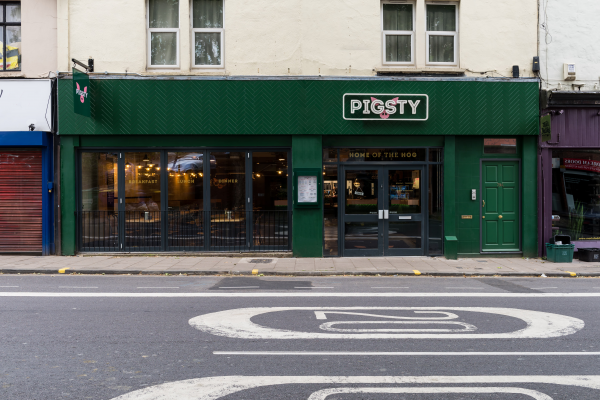 Pigsty has a large, glazed shopfront with five tall fold-back windows, set with a green herringbone timber surround. The logo, in white, plus the snout-and-ears brand mark sit over the door and are also used for the projecting sign, whilst gold-painted lettering directly over the entrance doors introduces key brand messaging - ‘Home of the Hog’. 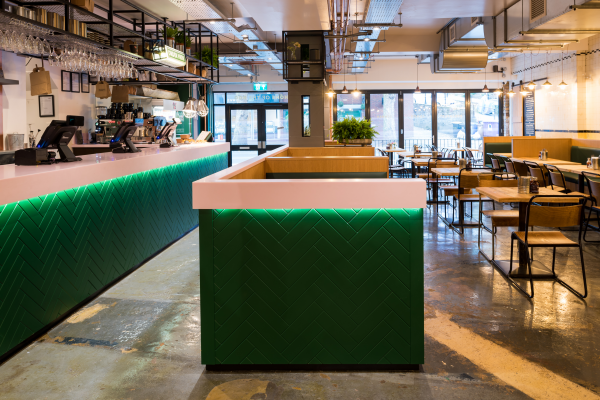 Inside, the layout includes an open kitchen to the rear, underlining a feeling of transparency and adding theatre, with the surround to the kitchen pass clad in a green ceramic tile with striking pink grouting. For the walls, original uncovered white tiling from the butcher’s shop has been kept wherever possible with new white tiling added to complete the look. The ceiling features an industrial, exposed look, with steel tracks and copper pipes, whilst lighting includes old-style metal lights, as well as more contemporary exposed-bulb pendants and a couple of height-adjustable pig lamps with curly coils; a genuine farm out-take, where they are used to keep baby piglets warm. 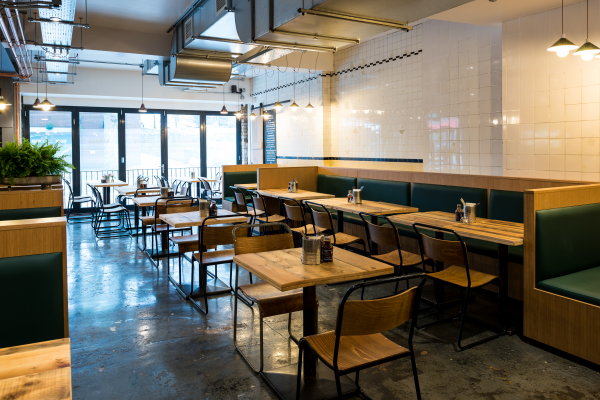 When the site turned out to have housed a pork butcher (James Brown Butchers, 1900-1950), a further strand of inspiration was added, with trace elements of that shop and era going on to become an organic part of the new concept, including original tiling and areas of exposed concrete flooring, complete with historic marks and scuffs. In addition to the exposed areas of concrete flooring, grey timber has been used in some sections. 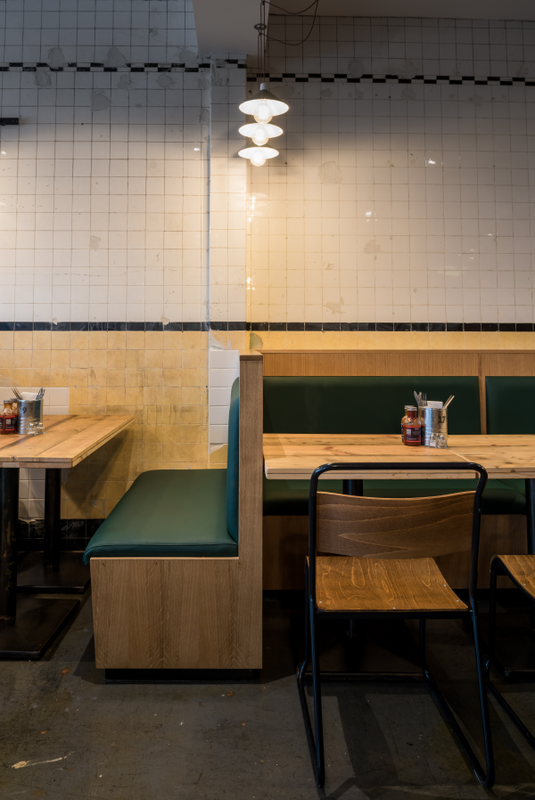 Tables are bespoke and made by Simon Kohn Furniture Ltd (Mr Kohn Snr, a well-established furniture-maker and also based in Bristol) and are wood-topped with simple metal legs. 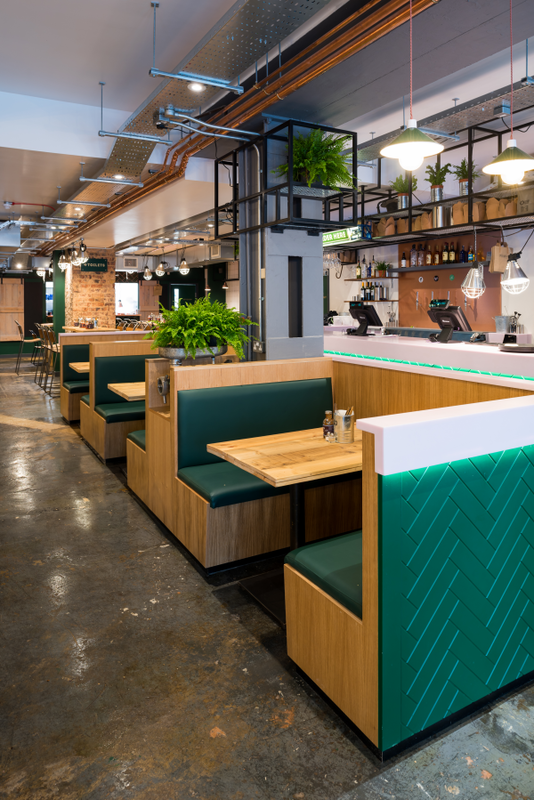 Booth seating is in natural timber with green leather seat pads, with green herringbone timber as the external surround, whilst an eclectic collection of freestanding chairs with metal frames and wooden seats and backs have been sourced from antique markets for a ready-worn, vintage feel.